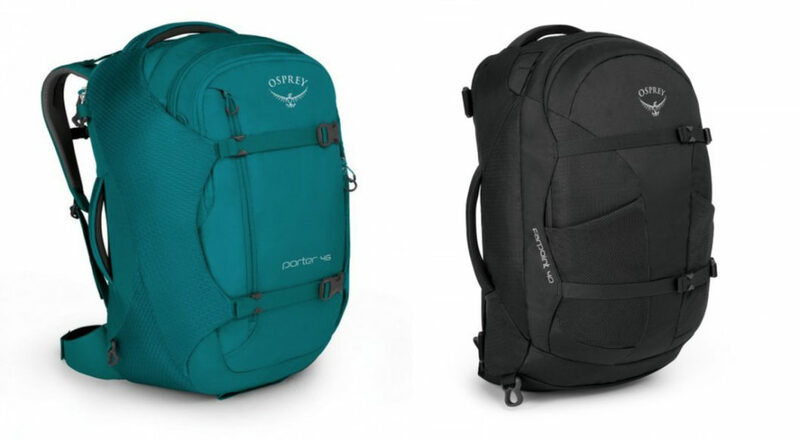 The Osprey Porter 46 and Osprey Farpoint 40 are considered travel backpacks, as they are designed to pass the carry-on size requirements that most airlines use. They also provide many pockets and storage compartments for keeping your travel items organized. However, there are differences between these two backpacks that you should explore before making your purchase. With the Osprey Farpoint 40, you get an extra pocket, along with a little less storage space. As mentioned, there is also a smaller Farpoint backpack. The 38-liter capacity Farpoint is just a little smaller. However, for comparisons to the Porter 46, the 40-liter capacity option is used. While the Farpoint 40 is smaller than the Porter 46, they have many of the same features and options. For example, they both include multiple carrying handles. They both include top and side carry handles, a duffel bag strap, and backpack straps, giving you more ways to wear or carry the backpack. Both backpacks also include a laptop sleeve and a tablet sleeve inside the main compartment. These sleeves help shield and protect your electronics. However, the sleeves sizes vary. You also get a variety of pockets with either option. While the Farpoint 40 includes one more pocket than the Porter 46 backpack, both options provide enough storage solutions to help you keep your gear organized during your trip. The Osprey Porter 46 includes a travel organizer to make it easier to reach items that you need quick access to, such as your keys or phone.The internal design of the Porter 46 is also superior to the Farpoint 40. While it contains one less pocket, the Porter 46 offers a little more storage space. With a 46-liter capacity, you can store more with this backpack, including a laptop and tablet. While both options include laptop and tablet sleeves, these sleeves inside the rear compartment on the Osprey Porter 46 backpack. Placing the sleeves in the rear compartment provides a little more cushioning for your electronics, in case your drop your backpack or land on your back. The laptop sleeve on the Osprey Porter 46 is also slightly taller. It can fit laptops up to 17-inches in size, while the Farpoint 40 can only fit laptops up to 15.6-inches in size. Another benefit of the Porter 46 is the option to purchase a removable daypack. While the daypack is not included with the backpack, you can purchase it to increase your storage capacity. The Osprey Farpoint 40 also has several great advantages. It includes one extra pocket compared to the Porter 46 and is available in two sizes. Along with the extra pocket, you get a water bottle holder, which is not included on the Porter. The Farpoint also features a middle compartment with a removable divider. When you keep the divider inside the compartment, you can easily separate it into two smaller storage areas. The Farpoint 40 backpack is also the more comfortable option. It features thick, padded shoulder straps, while the straps on the Porter 46 are thin and likely to cause discomfort if you wear it all day. Which Travel Backpack Should You Buy? While both these backpacks are great for traveling, the Farpoint 40 provides several benefits over the Porter 46. It is more comfortable, provides more organization, and it's affordable. However, it also offers less storage space than the Porter 46. The placement of the laptop and tablet sleeves in the front compartment is also a drawback, as it increases the risk of damage to your electronics if you drop your pack. If you want the most versatility and comfort, choose the Osprey Farpoint 40. However, if you require the extra storage space, the Osprey Porter 46 has you covered.